Gamepads don't really work well as controllers for first-person shooters and online role playing games. Those games are thoroughly optimized for use with a keyboard and mouse, but that’s not to say that those controls can’t be improved upon. Enter WolfKing’s Warrior, one of the more unique gaming input devices I’ve seen. Though it’s billed as a “gaming pad” by WolfKing, calling it that leads to you think of a PlayStation or Xbox controller. Nothing could be further from the truth. The Warrior is a USB input device that's technically recognized as a keyboard when you plug it in. It’s circular (about the size of a small plate) and it includes 55 keys and controls placed in a radial pattern. All of the keys you commonly use to control your first-person shooter and role-playing games are within easy reach of your fingers, and it doesn’t take long at all to adapt to them. Although the Warrior comes with no software, getting the Mac to recognize it is a plug-and-play affair—with a caveat. Generally, when the Mac encounters a new keyboard, the Mac asks you to press the keys immediately to the left and right of the Shift keys at opposite ends of the keyboard, so the Mac can figure out if you’re using a Japanese, European or English keyboard layout. This is a bit easier said than done with the Warrior, because there’s only one Shift key. It takes a few keystrokes, but eventually the Mac gives up and just asks you to select which keyboard you think the Warrior is. Identifying it as a regular English keyboard works. WolfKing doesn't specifically identify the Warrior as Mac-compatible, but it does work fine with the Mac, just as a PC-compatible USB keyboard works with the Mac. It shouldn’t cause any problems, provided you have an available USB port to use. The Warrior works just like any USB keyboard does on the Mac. The Warrior's 55 keys are the most commonly used keys you’ll find in most FPS games, and in many MMORPGs as well. What’s more, most of those games feature some sort of key remapping capability, so if you come across keys that aren’t normally used, you can typically get them working without too much of a problem. The main ones used to circumambulate in games—W,A, S and D—are right underneath your index and middle fingers, while the space bar—most often used to jump—is only a thumb press away. Number keys, keys often used to initiate voice chat (if you’re using a headset), auxiliary keys used to activate alternate weapons settings and adjust inventory, are all laid out within easy reach of your hand. The Warrior does take some getting used to because it isn’t a QWERTY layout, and if you’re accustomed to touch-typing in your games, your muscle memory will need remapping. Once you get the hang of it, your performance will increase with the Warrior fairly rapidly. The white layout with chrome accent is complementary to Apple keyboards (WolfKing offers the Warrior in a number of custom colors so you can match it to your décor). The USB cable is a good five feet long. While cordless or Bluetooth connectivity might be preferred, that would obviously add expense to the device. Underneath you’ll find a couple of risers that can lift the upper portion of the Warrior by about an inch, just as you find on many standard keyboards. Three function buttons on the other rim of the keyboard let you adjust volume up and down or activate the Escape function. A red LED lets you know when the keyboard is powered. WolfKing also sells a full sized QWERTY keyboard with an additional 40 key layout similar to the Warrior on the left hand side; it’s called the Timberwolf. What stops me from recommending it is that none of the extended media function keys that span the top of the keyboard work with the Mac (the Timberwolf needs Mac OS X driver software to do that). 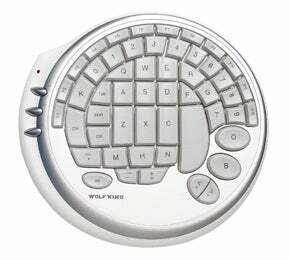 If you can get by with just the standard keys plus the circular layout, the Timberwolf does work with the Mac. Not everyone will find the Warrior useful or necessary. But if you’re an avid FPS or MMO player and you’re looking for an edge, the Warrior can provide you with one – presuming you take the time to really get the hang of it and use this keypad to its full ability.